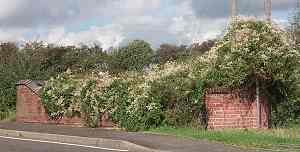 Opposite London Lane on the main road is a brick-built circular pound or pinfold which would have ben used to hold straying animals. 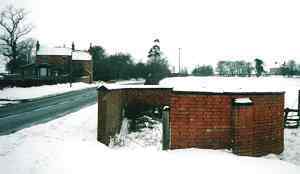 Although this structure is no older than the 19th century it is probable that it would have been preceded by a series of cob-walled or wooden structures. The parish records for 1629 show that 16 shillings was spent on eight quarters of lime and 7s/6d for fetching from Barrow. Cob-walled structures needed regular lime-washing to prevent frost damage and this gives a clue as to the probable construction of the pinfold of this period. Unfortunately we do not know if it was on the site of the surviving one. By 1991 the lime mortar had seriously deteriorated but the sturcture was essentially still complete, making it one of the best-preserved pounds in the region. Sadly an ill-advised 'restoration' in the early 1990s badly mutilated the south wall and entrance.